Phonographic Copyright (p) – Wichita Recordings Ltd. Copyright (c) – Wichita Recordings Ltd. Engineered at Electrical Audio, July 2011. Mastered at Joe Lambert Mastering, USA. (p) 2012 Wichita Recordings Ltd., under exclusive licence from Cloud Nothings. 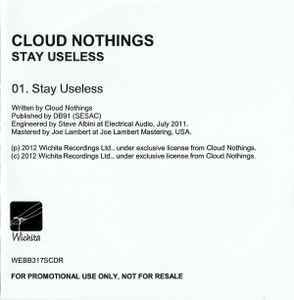 (c) 2012 Wichita Recordings Ltd., under exclusive licence from Cloud Nothings. For promotional use only, not for resale. Track duration not printed on the release.